(Nanowerk Spotlight – Application Notes) Improvements in the design of medical equipment for better streamlined functionality and performance is influenced by a number of critical factors. The research, design, modeling, testing, prototyping, and FDA and EU approvals of new mechatronic devices, or the integration of changes to existing designs, usually represents a sizable capital investment of resources well before the equipment goes into serial production. Factored into the medical device's product development are considerations such as size of the equipment, speed of operation, heat generation, portability, handling of static or kinetic loads, power sources, measuring systems, vacuum and nonmagnetic requirements, sensors, machine controls, component part wear and diagnostics. Custom piezoelectic disk actuators precisely dose liquids and gases in the ThinXXS micropump. A key impetus for medical and bioresearch companies to engage upon these involved product development cycles is the opportunity to capitalize on advances in technology for the manufacture of better operating, lower cost and more efficient equipment and devices. A recent improvement in high-speed laser scanning, for example, has facilitated the release of Harvard Medical School's latest optical imaging technique, Optical Frequency-Domain Imaging (OFDI), which is capable of providing unprecedented ultra-detailed 3D visualization of a patient's coronary arteries. OFDI operates at several magnitudes improvement over its predecessor, Optical Coherence Tomography (OCT), which itself was enabled by earlier advances in laser scanning 15 years prior. Piezoelectric High-Speed Microscope Objective Nanofocusing Device (Z-Motor) provides ms responsiveness, nm resolution, essential for DNA research. are recent advances in motor technology, specifically piezoelectric motors and actuators. Medical device manufacturers are increasingly choosing to use piezoelectric motors and actuators in preference to conventional electromagnetic motors because they exhibit substantial inherent advantages in medical equipment design over conventional EM motor technology. Piezoelectric devices are being used successfully in a widening range of medical applications including ultrasonic emitters, artificial fertilization, medical nano-microliter pumps, micromonitoring, surgery devices, MRI compatible robots, microdose dispensing, cell penetration and cell imaging in cytopathology, medical material handling such as pick-nplace systems, drug delivery devices, 3D scanning and for laser beam steering in ophthalmology, dermatology and cosmetology. 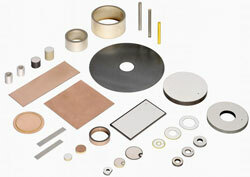 Variety of piezoceramic disks and tube actuators for applications such as micropumps and nebulizers. to produce mechanical energy in response to electrical signals, and conversely, is capable of producing electrical signals in response to mechanical stimulus. The use of piezoelectric materials dates back to 1881 when Pierre and Jacques Curie observed that quartz crystals generated an electric field when stressed along a primary axis. The term piezoelectric derives from the Greek word 'piezein', meaning to squeeze or press, relating to the electricity that results from pressure applied to a quartz crystal. Piezoelectric ceramics consist of ferroelectric materials and quartz. High-purity PZT (plumbum, zirconate, titanate) powders are processed, pressed to shape, fired, electroded and polarized. Polarization is achieved using high electric fields to align material domains along a primary axis. 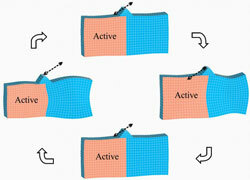 Piezoelectric actuators in their basic form provide very small displacement, but can generate huge forces. The minute size of the displacement is the basis for the high precision motion they can deliver. For long travel ranges, a clever arrangement of multiple actuators, or the operation of a single piezoelement at its resonance frequency have proven to be viable concepts. 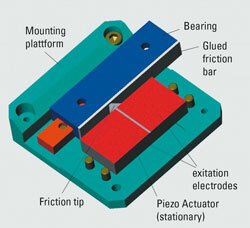 These types of piezo motion devices are called piezo motors. The latest designs of piezo motors have a number of advantages over electromagnetic motors when being considered for use in medical equipment and devices. Two types of piezo motors in particular have considerable attributes making them ideal for medical applications. Ultrasonic piezo linear motors (also called resonant motors), and piezo stepper motors. Both versions can basically provide unlimited travel (movement), yet they are very different in their design, specifications and performance. In ultrasonic piezoelectric motors, the piezoelectric ceramic material produces high-frequency (inaudible to the human ear) acoustic vibrations on a nanometer scale to create a linear or rotary motion. Dynamic phases in a stator plate of a piezo ultrasonic motor. For large travel ranges, especially when high speeds are also required, ultrasonic linear drives are used. With resolutions as good as 50 nm they become a better alternative to electromagnetic motor-spindle combinations. The ultrasonic drives are substantially smaller than conventional EM motors, and the drive train elements needed to convert rotary to linear motion are not required. Ultrasonic piezoelectric linear motors employ a rectangular monolithic piezoceramic plate (the stator), segmented on one side by two electrodes. Depending on the desired direction of motion, one of the electrodes of the piezoceramic plate is excited to produce high-frequency eigenmode oscillations (one of the normal vibrational modes of an oscillating system) of tens to hundreds of kilohertz. An alumina friction tip (pusher) attached to the plate moves along an inclined linear path at the eigenmode frequency. Through its contact with the friction bar, it provides micro-impulses and drives the moving part of the mechanics (slider and turntable) forward or backwards. With each oscillatory cycle, the mechanics executes a step of a few nanometers. The macroscopic result is smooth motion with a virtually unlimited travel range. Design of a compact ultrasonic piezo motor linear translation stage. 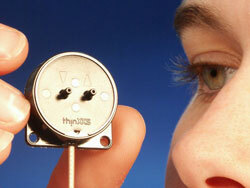 New ultrasonic resonant motors, such as the PILine? model developed by Physik Instrumente ? who has played a pioneering role in advancing development of piezo devices for medical applications ? are characterized by very high speeds to 500 mm/s, in a very compact and simple design. Such motors can produce accelerations to 10 g. They are also very stiff, a prerequisite for their fast step-and-settle times (on the order of a few milliseconds) and provide resolution to 0.05 µm. Piezo stepper linear motors usually consist of several individual piezo actuators and generate motion through a succession of coordinated clamp/unclamp and expand/contract cycles. Each extension cycle provides only a few microns of movement, but running at hundreds to thousands of Hertz, achieves continuous motion. Even though the steps are incremental, in the nanometer to micrometer range, they can move along at speeds in the 10mm per second range, taking thousands of steps per second. Piezo stepper motors, such as PiezoWalk?, also developed by Physik Instrumente, can achieve much higher forces of up to 700 N (155 lb) and picometer (one trillionth of a meter) range resolution compared to ultrasonic piezo motors. Resolution of 50 picometers has been demonstrated. The motor is capable of performing extremely high-precision positioning over long travel ranges, and when the position has been reached then performing highly dynamic motions for tracking, scanning or active vibration suppression. Like the ultrasonic piezo motors, these motions can be conducted in the presence of strong magnetic fields or at very low temperatures. 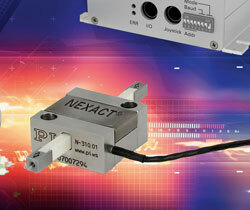 There are a number of different piezo actuators and motor types that are currently available. The most common ones are listed below. Stacked actuator ? most common type. High force, fast response, short travel. Shear actuator ? lateral motion, very fast, XY systems available. 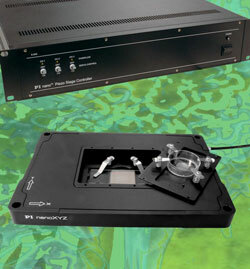 High force, very high frequency possible, travel typically limited to 20 µm. Tube actuator ? mostly for micro-dispensing applications and AFM scanners. Bender actuator ? long travel (deflection) to several mm possible, but low force and low frequency. B) Flexure-Guided, Piezo Actuator – frictionless flexures and motion amplifiers provide longer travel, and extremely straight motion. The motion is basically proportional to the drive voltage. Motion range up to 2 mm and above. Unlimited motion, high speed, fast response (10 to 10s of millisecs). Due to friction, resolution is limited to typically 50 nm. Based on accumulation of small controllable steps. Picometer resolution dither mode (direct piezo actuation). Medical devices can be made smaller, more precise, lighter and easier to control by employing piezoelectric motors. (1) Higher Force Generation Supports Miniaturization: Piezoelectric motors are better suited for miniaturization. They can easily be made smaller and more compact than electromagnetic motors, yet for their size they provide greater force. Compact, yet forceful nonmagnetic piezo linear motor with controller. The efficiency of electromagnetic motors falls as their dimensions are reduced with more of the electrical power converted to heat, whereas with piezoelectric motors their efficiency stays virtually constant. Being the same volume and weight, the stored energy density of a piezo motor is ten times greater than that of an electromagnetic motor. The most advanced versions of piezo motors are configured into extremely compact, high-speed micro-positioning stages that are smaller than a matchbox – the smallest piezo motor-driven stages are currently being used in autofocus devices for cell phone cameras. Because piezo motors provide a higher force per motor size, this has allowed equipment and instrumentation (including medical devices) to be reduced in size, while maintaining or increasing performance. (2) Improved Positioning Accuracy: The direct-drive principle of the piezo motor eliminates the need for a supplementary transmission or gear train found in conventional electromagnetic motors ? this avoids the usual backlash effects that limit accurate tracing which creates a critical reduction in positioning accuracy in electromagnetic servo-motors. The mechanical coupling elements otherwise required to convert the rotary motion of classical motors to linear motion are not necessary. The intrinsic steady-state auto-locking capability of piezoelectric motors does away with servo dither inherent in electromagnetic motors. Piezo motors can be designed to hold their positions to nanometer accuracy, even when powered down. (3) Faster Acceleration: Piezo devices can react in a matter of microseconds. Acceleration rates of more than 10,000 g (response times of 0.01 milliseconds) can be obtained. The atomizer head of the eFlow? 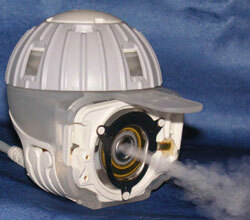 rapid Electronic Nebulizer series employs an annular ultrasonic piezo transducer. (4) No Magnetic Fields: For medical and biotechnology applications, piezoelectric motors are ideal as they do not create electromagnetic interference, nor are they influenced by it, eliminating the need for magnetic shielding. This feature is particularly important for motors used within strong magnetic fields, such as with MRI equipment, where small piezo motors are used for MRI-monitored microsurgery and large piezo motors for rotating patients and equipment. Magnetic fields and metal components in conventional electronic motors make it impossible for motorized medical devices to function within MRI equipment. (5) No Maintenance or Lubrication, Aseptic Enabled: Because the piezo motion depends on crystalline effects and involves no rotating parts like gears or bearings, they are maintenance free and do not require any lubrication. They can be sterilized at high temperatures, a significant advantage in medical applications. (6) Reduced Power Consumption: Static operation, even holding heavy loads for long periods, consumes virtually no power. Also, since the efficiency of piezoelectric motors is not reduced by miniaturization, they are effective in the power range lower than 30W. This makes piezo motors attractive for use in batteryoperated, portable and wearable medical devices because they can extend the life of a battery as much as ten times longer. (7) No Heat Generation: When at rest, piezo motors generate no heat. Piezoelectric motors also eliminate servo dither and the accompanying heat generation, an undesirable feature of electromagnetic motors. (8) Vacuum-Compatible: Piezo motors are in principle vacuum-compatible, a requirement for many applications in the medical industry. (9) Operable at Cryogenic Temperatures: Piezoelectric motors continue to operate even at temperatures close to zero kelvin, making them suitable for operation in extremely cold environments, such as in medical laboratory storage facilities and in cryogenic research. (10) Inflammability: Piezo motors are inflammable and therefore safer in the event of an overload or short circuit at the output terminal, a considerable advantage for portable and wearable medical devices. (11) Power Generation: Piezo devices can be used to harvest energy. For example, using a person's motion to power small medical or electrical devices such as pacemakers or health monitors. In Optical Coherence Tomography, piezoelectric motors are used to impart rapid periodic motion to the unit's reference mirror and imaging optics. To enable creation of two- and three-dimensional images from optical interference patterns, optical fibers must be moved both axially and laterally during the scan. Piezo motors have proven to provide more precise movements resulting in improved image resolution over conventional electromagnetic motors. Point-of-care and medical test equipment engage piezo technology. Where extremely fine tuned positioning and measuring equipment is required, piezo motors fill the need, which can create motion with extreme precision, from inches to nanometers. Piezoelectric actuators are beginning to be used for transdermal drug delivery, such as with a needle-free insulin injection system. Monitoring of endoscope-gastroscope devices is also beginning to be employed using piezoelectric devices. Biomedical micro-tools, such as tweezers, scissors and drills, have been adapted to a micro-robot base powered by piezo motors. Piezo motors are becoming more prevalent in micro-surgery and non-invasive surgery tools. 3D Cone Beam Imaging, used in orthodontics and for treating sleep Apnea patients to obtain an exact model of the oral cavity for fitting oral appliances, employs the use of piezoelectric actuators. Confocal microscopy used in ophthalmology for quality assurance of implants uses piezoelectric motors. Very precise motion of the optics is required to adjust the focal plane and for surface scanning. 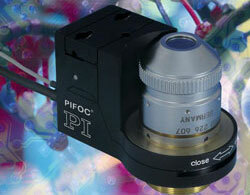 Piezoelectric positioning systems are integrated directly into the optics. Electromagnetic devices dominate the drive mechanisms in medical equipment designs today. However, increasing accuracy requirements in the micron and nanometer ranges, along with an inclination to miniaturization, dynamics streamlining and interference immunity are pushing the physical limitations of electromagnetic drive systems. Piezoelectric motors are proving to be a viable alternative, finding their way into a growing number of medical device applications.